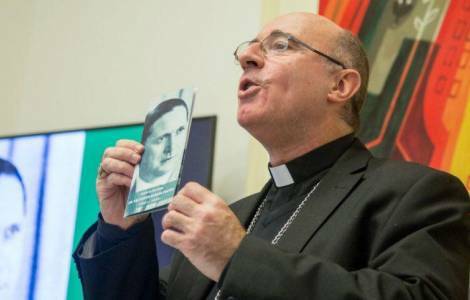 Montevideo (Agenzia Fides) - The cause of canonization of Dr. Salvador García Pintos officially began on 25 July in Montevideo. He was a doctor, politician, professor, journalist, director of Catholic civil society institutions, married and father of seven children. Born in Montevideo in 1871, he died in La Floresta in 1956. The deed of settlement of the diocesan court, presided over by Cardinal Daniel Sturla, Archbishop of Montevideo, was held in the archdiocese, in the presence of numerous descendants of the Servant of God. Some of them are the promoters of the cause, through an association created for this purpose. The promoter, Gerardo García Pintos, read excerpts of the letter in which they asked the archdiocese to open the trial: "since his death, the life of Salvador García Pintos has been exemplary not only for his numerous descendants, but also for the 2,273 people who have explicitly adhered to the request to present the case. And the Facebook page, created less than a year ago, has already been visited by about 50,000 people, with increasing news of people asking his intercession and there are written cases that testify his holiness". Cardinal Sturla described the doctor as "a person who defended human life from conception", alluding to his role as a parliamentary opponent of the legalization of abortion in the 30s - which, thanks to his work, returned to be considered a crime. Marta, one of the two doctor’s children who is still alive, spoke to those present: "The Pope defines the Beatitudes as the 'identity card of Christians'. I saw how my father lived them and how he practiced love for his neighbor described in chapter 25 of the Gospel of Matthew. "The court will now have to gather testimonies and documentary evidence to demonstrate the candidate's practices of heroic virtues.